WEST WINDSOR – Mercer County Community College (MCCC) President Dr. Patricia C. Donohue, who will be retiring in June after nearly a half-century in education, received the Michael Bennett Lifetime Achievement Award from national community college honor society Phi Theta Kappa (PTK) during the organization’s annual convention in San Antonio, Texas. The award is presented to retiring college administrators who have provided consistent support to PTK during their college careers. In November, Donohue announced that she would retire on June 30, concluding a 49-year career in education spanning secondary and higher education environments on the community college and university levels. Donohue was nominated by the MCCC chapter of PTK, which was made up of a committee of faculty and students, according to MCCC Professor Jingrong Huang, PTK faculty advisor. The nomination cited Donohue’s active involvement in the Mercer PTK chapter, her leadership, and active involvement in recruiting new members. Under Donohue’s guidance, the Mercer PTK chapter achieved five-star status and produced several nationally-recognized honor students. Among them is Jack Kent Cooke scholar David Hoyt, who went on to attend Stanford University; Coca-Cola New Century Scholar Anderson Monken, selected as the top junior college student in New Jersey, now studying at Vanderbilt University; and Sierra Downs, recipient of the Lea Plarski Award as the nation’s top junior college female student athlete, currently a student at Boston University. 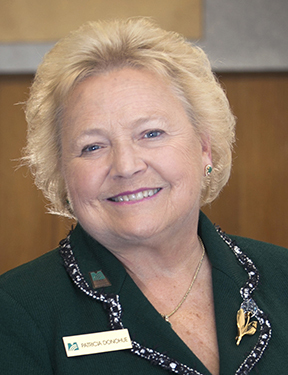 MCCC President Dr. Patricia C. Donohue, recipient of the Lifetime Achievement Award from Phi Theta Kappa, the national junior college honor society. The Michael Bennett Lifetime Achievement Award is presented to college presidents/campus CEOs at two-year or senior institutions and state community college system directors who are retiring and provided consistently outstanding support to PTK chapters and advisors during their careers. They are named in honor of the late Dr. Michael Bennett, longtime president of St. Petersburg College in Florida. The PTK Honor Society, headquartered in Jackson, Mississippi, is the largest honor society in higher education with 1,285 chapters on college campuses in all 50 of the United States, plus Canada, Germany, the Republic of Palau, Peru, the Republic of the Marshall Islands, the Federated States of Micronesia, the British Virgin Islands, the United Arab Emirates and U.S. territorial possessions. More than three million students have been inducted since its founding in 1918, with approximately 134,000 students inducted annually.